A. Where in the Bible is the most beautiful description of the Lord's church? 1. In Daniel 2, where we read about the eternal kingdom that sweeps away the kingdoms of the earth? 2. In Isaiah 2, where we read about the house of God established on the mountains to which all nations are drawn? 3. In Joel 2, where the establishment of the church is described as the great and awesome day of the Lord? 4. In Ezekiel 40, where the church is described as a huge temple constructed according to the pattern of God? 5. In Matthew 13, where Jesus gave us the parables of the kingdom? 6. In Matthew 16, where Jesus promised to build his church? 7. In Acts 2, where we read a firsthand account of the church's establishment? 8. In Ephesians 5, where Paul beautifully describes Jesus' love for his church as a husband's love for his bride? 9. In Hebrews 12, where the church is described as the city of the living God? B. Each of these is beautiful, but none of these would be my choice for the most beautiful description of the church. 1. Instead, I would turn immediately to the very end of the Bible – to Revelation 21 and 22. In my opinion, those two chapters contain the most beautiful description of the Lord’s church found anywhere in the Scriptures. 3. But before we can fully appreciate and understand the descriptions in Revelation 21-22, we need to understand why those chapters were written. A. To understand Revelation, you must understand its timeframe. 1. Nothing in the book of Revelation is more clear than its timeframe, and yet nothing in the book of Revelation has been more universally ignored. 2. Virtually every prophecy in the Bible includes a timeframe – God tells us what will happen and he tells us when it will happen. Revelation is no exception. Timing is the difference between prediction and prophecy. I may predict that a woman will one day be president of the United States; but that prediction becomes prophecy after I tell you when she will be elected. a) Revelation 1:1 The Revelation of Jesus Christ, which God gave Him to show His servants – things which must shortly take place. b) Revelation 1:3 Blessed is he who reads and those who hear the words of this prophecy, and keep those things which are written in it; for the time is near. c) Revelation 10:5-6 The angel whom I saw standing on the sea and on the land raised up his hand to heaven 6 and swore by Him who lives forever and ever, who created heaven and the things that are in it, the earth and the things that are in it, and the sea and the things that are in it, that there should be delay no longer. d) Revelation 22:6 Then he said to me, "These words are faithful and true." And the Lord God of the holy prophets sent His angel to show His servants the things which must shortly take place. e) Revelation 22:10 And he said to me, "Do not seal the words of the prophecy of this book, for the time is at hand. (1) This last verse is particularly instructive. In Daniel 8:26, Daniel was told to seal up his vision because its fulfillment was a long way off. Daniel's vision was received in 550 BC and concerned an event that occurred in 165 BC – that is, Daniel was told to seal up the vision because it concerned an event that was 400 years in the future. (2) John is told just the opposite here in verse 10. He is told to not seal the book. Why? Because the time is at hand. What basis then is there for placing the fulfillment of this book at least 2000 years (and counting!) after the time it was written. If it were really that far in the future, wouldn’t God have told John to seal up his vision like he told Daniel? 4. To understand Revelation, we must understand its timeframe. If we miss this point, then we have very little hope of unraveling the meaning of the book. B. To understand Revelation, you must know the hero of the book. a) The faithful witness, the first born of the dead, the ruler of kings on earth, the first and the last, the living one, the true one, the one with the key of death, the one with the key of David, the lion of Judah, the lamb that was slain, the king of kings, the lord of lords, the alpha and omega, and the bright morning star. 2. Not only is Revelation a book about Christ, but it is a book about the church of Christ, and particularly the victory of that church over a great enemy. a) If the entire book of Revelation were reduced to a single sentence, that sentence would be "WE WIN!" b) Of the 28 uses of the verb "conquer" in the New Testament, 27 occur in this book. Revelation is all about a great conflict and the victory of the Lamb and his church. 3. "Beautiful beyond description is the last book of the Bible. Beautiful in form, in symbolism, in purpose, and in meaning. Where in Scripture do we find a more vivid and picturesque portrayal of the Christ, Faithful and True, going forth unto victory, seated upon a white horse, arrayed in a garment sprinkled with blood, followed by the armies of heaven?" C. To understand Revelation, you must know the villain in the book. 1. Revelation is a book about a great enemy of the Lord and his church, and that great enemy was the mighty Roman empire and the power behind that empire, which was Satan. Satan, through Rome, was trying to eliminate the church. 2. Many theories have been proposed about who the villain is in this book. Why am I so certain it was Rome? a) In Revelation 17:9 the villain is described as a blood thirsty harlot sitting upon seven hills who is drunk with the blood of the saints. b) A Roman coin minted at the time the book was written has been found, and that coin depicts Rome as a beautiful woman sitting upon the seven hills that surrounded the city. c) Now, if you had been living in the first century, if you had that coin in your pocket, if you were suffering fierce persecution at the hands of the Romans, and if someone handed you a copy of Revelation 17, who would you think it was talking about? The only possible answer to that question is Rome. 3. History tells us about the fierce persecution of Christians by Rome. a) To cite but one example, Tacitus describes how Christians were covered with the skins of wild beasts and torn to death by dogs. He tells us they were fastened to crosses and burned to serve as lamps by night. 4. Revelation 13:4 describes Rome as a beast given authority by a dragon (Satan), and it asks, "Who is like the beast, and who can fight against it?" a) Who could fight against Rome? Who could be as powerful as Rome? How could the church stand any chance in a battle with the mighty Roman empire? The book of Revelation gives us the answers to those questions. D. To understand Revelation, you must understand why it was written. 1. The book of Revelation was written to provide comfort and hope to the people of God as they were undergoing fierce persecution by the seemingly omnipotent Roman empire. The book was written to convince the people of God that they had not been abandoned. In fact, they were winning! 2. The book was written to answer the question posed in Revelation 6:10.
a) Revelation 6:9-10 When He opened the fifth seal, I saw under the altar the souls of those who had been slain for the word of God and for the testimony which they held. 10 And they cried with a loud voice, saying, "How long, O Lord, holy and true, until You judge and avenge our blood on those who dwell on the earth?" 3. Very simply, if our interpretation of Revelation is not a meaningful answer to that question in verse 10, then our interpretation is wrong. E. To understand Revelation, you must study the Old Testament. 1. No book of the New Testament is more steeped in the Old Testament than the book of Revelation. Revelation has more Old Testament references than any other New Testament book. Within the 404 verses in the book, there are 278 Old Testament allusions. 2. Most of the imagery in the book about the judgment of Rome comes from Old Testament descriptions of judgments against Assyria, Babylon, Judah, Israel, Egypt, Edom, and others. The first step in understanding this language in Revelation is to study how the same language was used in the Old Testament. 3. This language is also used elsewhere in the New Testament. In particular, it is used to describe the judgment of Jerusalem that occurred in 70 AD, and it is used to describe the final judgment that will occur at the end of the world. 4. The lesson is that we cannot determine from the language alone which judgment is being referred to. Instead, we must carefully examine the context in which that language is used. A. What is being described in these chapters? The church or heaven? 1. Revelation 21:1 Now I saw a new heaven and a new earth, for the first heaven and the first earth had passed away. Also there was no more sea. 2 Then I, John, saw the holy city, New Jerusalem, coming down out of heaven from God, prepared as a bride adorned for her husband. 2. Look at verse 2. John sees something in his vision, and he gives us four descriptions of what he sees. a) It is a holy city; It is the New Jerusalem; It comes down out of heaven from God; It is prepared as a bride adorned for her husband. 3. That third description is an important clue about what is being discussed here. Whatever John is describing cannot be heaven because what he is seeing came down out of heaven from God. But then what is it? a) It must be the church! The church is the New Jerusalem – the new dwelling place for God's people. The church is the holy city. (1) Hebrews 12:22-23 But you have come to Mount Zion and to the city of the living God, the heavenly Jerusalem, to an innumerable company of angels, 23 to the general assembly and church of the firstborn who are registered in heaven, to God the Judge of all, to the spirits of just men made perfect. b) Paul in Ephesians 5 describes the church as the bride of Christ. 4. But what about the new heaven and the new earth in verse 1? a) The figure of heaven and earth passing away is a common one in Scripture. The Bible uses that figure to depict the judgment of the ungodly by figuratively bringing their world to an end. b) In Isaiah 13, God dismantles the earth and the stars to depict the judgment of Babylon by the Medes. c) In Isaiah 34, the heavens are dissolved and rolled together as a scroll to depict a judgment against Edom. e) Rome thought it was supreme over heaven and earth, but Rome was wrong. God tells the church that he will judge Rome and then create a new heaven and a new earth without Rome anywhere to be found. He will destroy Rome's world and create a new world without Rome in it. f) Was Rome destroyed in the first century? No. History tells us it fell much later. Was Rome judged by God and sentenced to destruction in the first century? Absolutely! The book of Revelation tells us all about it. The sentence was so sure and certain, God began speaking of Rome in the past tense long before the empire actually fell. For more about the history of Rome and its fall, see the notes on Revelation available on the Internet at www.thywordistruth.com. 5. Why is the holy city shown coming down out of heaven from God? a) The church comes down out of heaven in contrast to the beasts of Rome that are depicted in this book as having come up out of the earth and sea. Rome had pretensions of divinity but it was of human origin; the church by contrast was of divine origin – it was not man-made. b) God’s people throughout this book are referred to as dwelling in heaven (even while they were still physically on earth and enduring persecution) and the wicked are referred to as dwelling on earth. (1) Colossians 3:2-3 Set your mind on things above, not on things on the earth. 3 For you died, and your life is hidden with Christ in God. c) Now that Rome and its world are gone, the church is pictured as returning to a world that has been made fresh and new. B. What can we learn about the church from Revelation 21-22:5? 1. Revelation 21:3 3 And I heard a loud voice from heaven saying, "Behold, the tabernacle of God is with men, and He will dwell with them, and they shall be His people. God Himself will be with them and be their God. a) We are now given a lengthy description of the church from God's perspective – and what a description it is! If we could only see ourselves as God sees us, I am convinced it would have a transforming effect. b) What about the future tense in these verses? Are these verses describing something about the church that was not true before the judgment of Rome? No. These descriptions had been true of the church all along and they continue to be true. The future tense is used to emphasize that these blessings would remain long after Rome had been judged and defeated. c) Look back in verse 1 for a moment. It says there was no more sea. In the Bible, the sea is used to denote separation. If there is a sea between us, then we are separated. But in this new world, there was no sea. God would dwell with his people. There would be no separation. (1) When will this occur? Now! It has been true of the church all along – and God wanted the church to know that those blessings would continue long after the mighty Roman empire was but a distant memory. (2) 2 Corinthians 6:16 And what agreement has the temple of God with idols? For you are the temple of the living God. As God has said: "I will dwell in them and walk among them. I will be their God, and they shall be My people." (3) Ephesians 2:19-22 Now, therefore, you are no longer strangers and foreigners, but fellow citizens with the saints and members of the household of God, 20 having been built on the foundation of the apostles and prophets, Jesus Christ Himself being the chief cornerstone, 21 in whom the whole building, being joined together, grows into a holy temple in the Lord, 22 in whom you also are being built together for a dwelling place of God in the Spirit. (4) We as Christians are looking forward to many blessings, but God dwelling among us is not one of them. Why? Because we already enjoy that blessing. God dwells with his church now. Christ’s perfect sacrifice made that reconciliation possible. 2. Revelation 21:4 4 "And God will wipe away every tear from their eyes; there shall be no more death, nor sorrow, nor crying. There shall be no more pain, for the former things have passed away." 5 Then He who sat on the throne said, "Behold, I make all things new." And He said to me, "Write, for these words are true and faithful." a) Now surely the language in verse 4 must apply to heaven and the end of the world. Right? Well, let's see. b) The preceding chapters have described the judgment and destruction of a great enemy of the church – one that inflicted death, sorrow, crying, and pain on the church. That enemy is now gone. What will the natural result be? No death, no sorrow, no crying, no pain. Why? Verse 4 tells us why – because the former things have passed away. c) What are the former things that have just passed away? The blood thirsty harlot and the two beasts are gone. Rome is no more. The condition of the church has just changed dramatically. d) But couldn’t this language apply to our condition in heaven? Yes, it could. The end of the world will certainly bring another dramatic change of circumstances for the church. But the context suggests that a different change in circumstances is being considered here – one that would occur soon after the book was written; one that was at hand. 3. Revelation 21:6 6 And He said to me, "It is done! I am the Alpha and the Omega, the Beginning and the End. I will give of the fountain of the water of life freely to him who thirsts. 7 "He who overcomes shall inherit all things, and I will be his God and he shall be My son. 8 "But the cowardly, unbelieving, abominable, murderers, sexually immoral, sorcerers, idolaters, and all liars shall have their part in the lake which burns with fire and brimstone, which is the second death." a) Verse 6 says "It is done!" What is it that had been done? (1) Satan and Rome had been defeated. Their world had been destroyed. Satan's most powerful tool against the church was no more. (2) The blood of the martyrs had been vindicated. A new world had been created that did not include Rome. The church had come back down from heaven to enjoy its new, changed environment. Everything had been finished with regard to Rome. It was done! b) The phrase "second death" in verse 8 was used earlier in chapter 20 to depict the fate of those who were on Rome’s side. (1) Did it include only the Romans? No. Verse 8 says it includes the cowardly, the faithless, and the polluted. That is, it includes those former Christians who renounced Christ in order to live, as well as their Roman persecutors. (2) The inheritance in verse 7 is reserved for those who overcome – not for those who give in. Those who saved their lives, lost their lives. 4. Revelation 21:9 9 Then one of the seven angels who had the seven bowls filled with the seven last plagues came to me and talked with me, saying, "Come, I will show you the bride, the Lamb's wife." 10 And he carried me away in the Spirit to a great and high mountain, and showed me the great city, the holy Jerusalem, descending out of heaven from God, 11 having the glory of God. Her light was like a most precious stone, like a jasper stone, clear as crystal. a) What are we about to see here in verse 9? Heaven? No. The angel says that we are about to see the bride of the Lamb. We are about to see the victorious church! We have reached the happy ending of this book! b) Verse 11 tells us that this great city has the glory of God. Elsewhere the Bible tells us that the church is the body of Christ, and that Christ and his church reflect the glory of God. (1) Hebrews 1:3 [Jesus,] who being the brightness of His glory and the express image of His person, and upholding all things by the word of His power, when He had by Himself purged our sins, sat down at the right hand of the Majesty on high. (2) Ephesians 3:20-21 Now to Him who is able to do exceedingly abundantly above all that we ask or think, according to the power that works in us, 21 to Him be glory in the church by Christ Jesus to all generations, forever and ever. 5. Revelation 21:12 12 Also she had a great and high wall with twelve gates, and twelve angels at the gates, and names written on them, which are the names of the twelve tribes of the children of Israel: 13 three gates on the east, three gates on the north, three gates on the south, and three gates on the west. 14 Now the wall of the city had twelve foundations, and on them were the names of the twelve apostles of the Lamb. 15 And he who talked with me had a gold reed to measure the city, its gates, and its wall. 16 The city is laid out as a square; its length is as great as its breadth. And he measured the city with the reed: twelve thousand furlongs. Its length, breadth, and height are equal. 17 Then he measured its wall: one hundred and forty-four cubits, according to the measure of a man, that is, of an angel. a) Here was have a description of the city – and it is remarkably numerical! It is also remarkably beautiful once we understand the symbols it uses. b) Those of us who have studied this book know that certain numbers have particular figurative meanings. (1) For example, 7 denotes perfection, 6 denotes a falling short of perfection (one less than a perfect 7), 3 denotes divinity (trinity), 10 denotes completeness (10 fingers, 10 toes), and 12 denotes the people of God (12 patriarchs, 12 apostles, 12 tribes). (2) Numbers can be combined in various ways to add emphasis. (a) For example, how would we describe someone who wanted to be a god but fell hopelessly short of divine perfection? Divine perfection might be denoted by 777 (three 7's). And what about one who aspired to divine perfection, but fell short? 666. (b) What about a period of completeness in which we will reign with Jesus Christ our savior? We would need to combine completeness (10) with divinity (3) – and we might get 1000 (103) years. (c) What about a description of ALL of God’s people? We need completeness (10), we need divinity (3), and we need God's people (12). What about 103 times 12 times 12? 144,000.
c) Now what about this great city in verses 12-17? It has 12 gates guarded by 12 angels with the names of 12 tribes inscribed on each gate. The wall had 12 foundations with the names of the 12 apostles inscribed on each. (1) Okay, there's definitely a message here! 12! Twelve is the number of God’s people, and this city is the dwelling place of God’s people. (2) Ephesians 2:20 says that the church is built upon the foundation of the apostles and prophets. And how may apostles were there? 12! The city of God described here is the church, the dwelling place for the people of God – ALL of the people of God. No one is left out. d) But why is the city being measured? (1) Ezekiel measured what he saw in Ezekiel 40-43 in order to stress its holiness and separation from what is common. (a) Ezekiel 42:20 He measured it on the four sides; it had a wall all around, five hundred cubits long and five hundred wide, to separate the holy areas from the common. (a) 2 Corinthians 6:16-17 And what agreement has the temple of God with idols? For you are the temple of the living God. As God has said: "I will dwell in them and walk among them. I will be their God, and they shall be My people." 17 Therefore "Come out from among them and be separate, says the Lord. Do not touch what is unclean, And I will receive you." e) What are the measurements? (1) The city is a perfect cube – 12,000 by 12,000 by 12,000 furlongs. (This description causes trouble for literalists since 12,000 furlongs is about 1500 miles.) The walls surrounding the city are 144 (12 times 12) furlongs high. Each measurement includes a twelve. (2) The message is that this city includes God's people, only God's people, and all of God’s people. Not one of God's people is left out. 6. Revelation 21:18 18 The construction of its wall was of jasper; and the city was pure gold, like clear glass. 19 The foundations of the wall of the city were adorned with all kinds of precious stones: … 21 The twelve gates were twelve pearls: each individual gate was of one pearl. And the street of the city was pure gold, like transparent glass. a) What a beautiful description! The foundations of the city are adorned with 12 precious jewels and the 12 gates are made of 12 pearls. (1) The church is described as a precious and beautiful city in the shape of a huge golden cube with golden streets. The number 12 appears in every measurement – this city is for the people of God. b) The city of pure gold with streets of pure gold is not a description of heaven – it is a description of the city of God that came down out of heaven. It is a description of the city where God presently dwells with his people – and that city is the church. John is describing the church! (1) We generally apply these descriptions to heaven, and they no doubt could apply to that beautiful home that God has prepared for his church. But the context suggests that those descriptions are used here to describe the church – not the future home of the church. These descriptions are certainly true of the church in heaven, but they are also true of the church now – wherever it is located. John is describing a people – not a place! (2) The church is the city of God – and how does God see his church? He sees it as a huge golden city with streets of gold. John is telling us how God sees his church! (3) Do we see ourselves as God sees us? Do we truly understand how beautiful the church is? Do we truly understand how important the church is? 7. Revelation 21:22 22 But I saw no temple in it, for the Lord God Almighty and the Lamb are its temple. 23 The city had no need of the sun or of the moon to shine in it, for the glory of God illuminated it. The Lamb is its light. a) Why is there no temple in the city? (1) In the Old Testament the temple stressed the separation between God and man. God lived in the inner sanctuary where only the High Priest could enter. God was inside the temple; men were outside the temple. (2) In this city, by contrast, God dwells with his people. There is no longer any separation between God and his people. b) Why is there no need of sun or moon? (1) Because the glory of God and the Lamb provide all of the light. Isaiah 60:19-20 uses this same imagery to describe the condition of spiritual Israel under the leadership of the Messiah. (a) Isaiah 60:19-20 The sun shall no longer be your light by day, Nor for brightness shall the moon give light to you; But the LORD will be to you an everlasting light, And your God your glory. 20 Your sun shall no longer go down, Nor shall your moon withdraw itself; For the LORD will be your everlasting light, And the days of your mourning shall be ended. 8. Revelation 21:24 24 And the nations of those who are saved shall walk in its light, and the kings of the earth bring their glory and honor into it. 25 Its gates shall not be shut at all by day (there shall be no night there). 26 And they shall bring the glory and the honor of the nations into it. 27 But there shall by no means enter it anything that defiles, or causes an abomination or a lie, but only those who are written in the Lamb's Book of Life. a) Verse 24 tells us that the nations shall walk by the light of this great city and that the kings of the earth shall bring their glory and honor into it. (1) One would expect a huge golden cube 1500 miles long in each direction would reflect some light and attract some attention! It is not God’s desire that his church be obscure and hidden. (2) God's view of the church and his mission for the church is to be a beautiful golden city that reflects his glory and gives light to a lost and dying world – and nowhere is that message stated any more clearly than it is here in these verses from Revelation 21.
b) God's people in his church are the light of the world. The church reflects the glory of God, and all nations flow to the church because of that light. (1) Matthew 5:14 You are the light of the world. A city that is set on a hill cannot be hidden. (2) Isaiah 2:2 Now it shall come to pass in the latter days that the mountain of the Lord's house shall be established on the top of the mountains, and shall be exalted above the hills; And all nations shall flow to it. c) We see in these verses a clue that will help us answer a question we will consider in just a moment. (1) At the time of this vision, the gates of this great city are still OPEN. (2) There will come a day when the gates of the Lord's church will be CLOSED. When the trumpet sounds and time is no more, the gates of that great city will close. But these verses are describing a time when those gates are still open! d) Verse 27 tells us that nothing unclean will enter this city. (1) The church is the body of Christ. Men and women are added to the church when they are saved. If you have been saved, then you are in the Lord's church. If you are not in the Lord's church, it is because you are not saved. 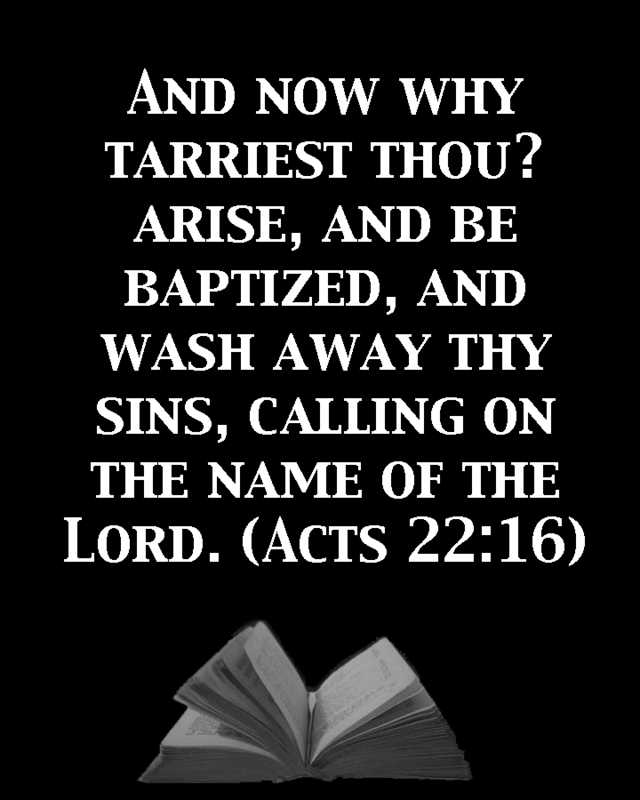 Those outside the Lord's church are unclean; those inside the Lord's church have been cleansed by the blood of the Lamb. e) The description of the church continues through the first five verses of chapter 22. 9. Revelation 22:1 And he showed me a pure river of water of life, clear as crystal, proceeding from the throne of God and of the Lamb. 2 In the middle of its street, and on either side of the river, was the tree of life, which bore twelve fruits, each tree yielding its fruit every month. The leaves of the tree were for the healing of the nations. 3 And there shall be no more curse, but the throne of God and of the Lamb shall be in it, and His servants shall serve Him. 4 They shall see His face, and His name shall be on their foreheads. 5 There shall be no night there: They need no lamp nor light of the sun, for the Lord God gives them light. And they shall reign forever and ever. a) In verse 2 we see a tree of life with 12 fruits. (1) This tree provides nourishment for God’s people just as the original tree of life did. (2) This tree provides 12 different kinds of fruit 12 times a year. The number 12 here indicates that whatever blessings are being discussed, they are blessings reserved for God's people. b) Verse 2 says that the leaves on the tree are for the healing of the nations. (1) Again, we see nations that need the light and healing that this city – the church – provides. The church sheds light on the darkness outside and provides healing to those who enter its gates. c) Verse 3 says that there will be no more curse. (2) That is the same picture we have here. The church, too, would dwell in security with Rome out of the way. There would be no more curse. d) Verse 3 tells us that the throne of God and of the Lamb is in this city. (1) God rules from his dwelling place, which is the church. (2) Ezekiel 43:7 says that God’s throne is located where he dwells – in the midst of his people forever. Ephesians 2:22 describes the church as a dwelling place of God in the Spirit. e) Verse 4 tells us that those inside the city shall see his face. (1) 1 Peter 2:9 describes the church as a royal priesthood. Every Christian has the same access to God as the High Priest had under the Old Covenant. In fact, we have more – Hebrews 4:16 says that we may boldly approach the throne of grace whereas the High Priest could enter the holy of holies only once a year. Those inside this city have personal access with God. (2) 2 Corinthians 3:18 But we all, with unveiled face, beholding as in a mirror the glory of the Lord, are being transformed into the same image from glory to glory, just as by the Spirit of the Lord. (3) Again, this is a blessing that the church is presently enjoying. (1) Romans 5:17 says that we reign in life through Jesus Christ; Revelation 5:10 says that we are a kingdom of priests who reign on earth; 1 Peter 2:9 says that we are a royal priesthood. (2) The church reigns with Christ now and forever. C. One final question: The Church Now or the Church Later? 1. I told you earlier that there was a question we would consider later. That question is whether Revelation 21-22 is describing the church as it is now or only as it will be later, after the end of the world. a) Sometimes the question is phrased as whether these chapters are describing the church militant (on earth) or the church triumphant (in Heaven). b) In my opinion, these chapters are describing the church as it is now – which in actuality is both militant and triumphant. a) We considered each blessing of the church described in these chapters, and we were able to find scriptures showing that those blessings were presently enjoyed by the church. b) The city is shown coming out of heaven from God, not going to heaven. c) The time frame of the book suggests an early fulfillment. d) The gates of this city are open, and the nations are shown as coming to it for healing. Those gates will be closed at the final judgment. f) The language from these chapters that we most often associate with heaven (no death, no tears, etc.) was used in the Old Testament to describe God's people after God had rescued them from foreign persecuting powers. I think the same language is used here for the same reason. g) And, if these chapters are really describing heaven after the end of the world, then just what exactly is that inheritance in verse 21:7 that is yet reserved for those who overcome? 3. But whether they are blessings of the church now or blessings of the church later, we can all agree that these chapters describe blessings enjoyed by the church. These blessings are for the people of God! 4. When God looks down at a world full of wickedness and sin, what does he see? He once looked down and saw only a single righteous family, and he destroyed that evil world with a flood. Today, he sees not a single righteous, physical family, but he sees his own righteous, spiritual family – the church. And what does that church look like to him? He sees it as a huge, beautiful, golden city reflecting his glory to a lost and dying world! 5. We often read these chapters and conclude that God is describing something we cannot see (heaven) in terms that we can understand. But if these chapters are describing the church (as I believe they are), then God is really describing something we can see (the church) – and he is telling us that we are not seeing it right! We are not seeing it as the beautiful, golden city of God that it is. These chapters are giving us God’s view of his church! 1. In Romans 8:31-39, Paul gives what I consider to be a summary of the book of Revelation, and whenever I teach the book of Revelation I end with that passage from Romans. It is also a good place to end our study of the church. a) What then shall we say to this? If God is for us, who is against us? 32 He who did not spare his own Son but gave him up for us all, will he not also give us all things with him? 33 Who shall bring any charge against God’s elect? It is God who justifies; 34 who is to condemn? Is it Christ Jesus, who died, yes, who was raised from the dead, who is at the right hand of God, who indeed intercedes for us? 35 Who shall separate us from the love of Christ? Shall tribulation, or distress, or persecution, or famine, or nakedness, or peril, or sword? 36 As it is written, “For thy sake we are being killed all the day long; we are regarded as sheep to be slaughtered.” 37 No, in all these things we are more than conquerors through him who loved us. 38 For I am sure that neither death, nor life, nor angels, nor principalities, nor things present, nor things to come, nor powers, 39 nor height, nor depth, nor anything else in all creation, will be able to separate us from the love of God in Christ Jesus our Lord. 2. What a wonderful description of the Lord's church! We are more than conquerors through him who loved us. If God is for us, who is against us? These 12 lessons will teach you about the Lord's church.